ESSENTIAL QUESTION How do mountains and seasonal winds shape the climate of India? India is a subcontinent, which is a large landmass that is like a continent, only smaller. The subcontinent includes present-day Bangladesh, Bhutan, India, Nepal, and most of Pakistan. It is often referred to as South Asia. Geographers think the kite-shaped Indian subcontinent used to be a separate land. It inched north until it hit Asia. The collision pushed up mountains where the two lands met. Those high mountains tower over the northern borders of India. They form several mountain ranges, including the Hindu Kush (HIHN•doo kush) and theHimalayas (HIHM•uh•LAY•uhs). In addition to tall mountains, the subcontinent has several great rivers. These include the Ganges (GAN•JEEZ) and the Indus. Like other rivers you have studied, these two rivers carry water for irrigation. The silt they deposit makes the land fertile. The Indus River valley was the home of the first Indian civilization. In ancient times, another river called the Saraswati (suh•RUHS•wuh•tee) ran parallel to the Indus. The Saraswati area was also home to great cities. However, it dried up, perhaps because of an earthquake. The Arabian Sea, Indian Ocean, and Bay of Bengal surround India. Ancient Indians sailed these waters to other ancient lands, such as Mesopotamia. This travel helped encourage trade. The tall mountains help block cold north winds from reaching much of India. As a result, temperatures are generally warm there. In addition, seasonal winds called monsoon , shape India's climate. Because of the monsoon, India has a dry season in the winter and a rainy season in the summer. The summer monsoon provides rain for India's crops. But these rains can also cause severe floods. A monsoon is a seasonal wind. India and Pakistan have two main monsoons: a summer monsoon and a winter monsoon. ESSENTIAL QUESTION Why was the earliest Indian civilization located near the Indus River? Huge Earth mounds dot the Indus Valley. Near them, people found burnt bricks and tiny stone seals covered with a mysterious writing. These finds caused further exploration of the mounds. Archaeologists uncovered the ruins of an ancient civilization. History in the Indus River valley followed the same pattern as in Sumer and Egypt. As in other regions, civilization along the Indus River began with agriculture. The earliest farmers raised wheat and barley. By 3000 B.C., they were growing cotton and making it into fabric—the first people in Asia to do so. They domesticated cattle, sheep, goats, and chickens. They also learned how to make copper and bronze tools, which were more effective than stone tools. People in the villages traded with one another. Over time, the Indus Valley people began to trade with people from farther away. The wealth they gained from trade helped them to develop a more complex culture. By 2500 B.C., some villages had grown to be great cities. The Indus and Saraswati valleys contained hundreds of cities. At least 35,000 people may have lived in the largest and best-known cities, Mohenjo-Daro (moh•HEHN•joh•DAHR•oh) and Harappa (huh•RAP•uh). Harappa gave its name to the entire Indus River culture. Today that ancient culture is called Harappan civilization. This civilization featured planned cities, which were cities that were built according to a design. Architects surrounded these cities with heavy brick protective walls. City streets crossed each other in a neat grid with square corners. Along the streets were homes, shops, and factories. The cities also had large public buildings that may have been used for religious or government functions. People in large cities always have to deal with the problem of removing human waste. Harappan cities were very advanced in that area. Almost every house contained a bathroom and a toilet. Underground sewers carried away the waste. People need to use much planning and organization to build such complex cities. Because of that, historians believe the ancient Harappans must have had powerful leaders. We do not know if priests or kings or a combination of both ruled the Harappans, but their government must have been strong. ESSENTIAL QUESTION What were the cultural features of Harappan civilization? A mysterious form of writing covered the stone seals that people found in the ruined cities. Some of those seals may have indicated types of trade goods. Some scholars think that the 500 pictographs, or picture signs, of Harappan writing may stand for words, sounds, or both. But they don't really know. No one has figured out how to read the writing of Harappan civilization. Until someone learns to read it, the only way we can learn about the civilization is by studying artifacts. Archaeologists have not identified the site of any temples for specific gods. But they have found evidence of religion. 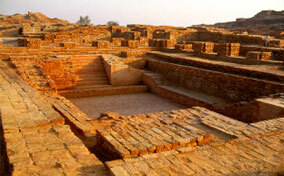 Mohenjo-Daro had a huge public bath that may have been used for religious rituals. (Many religions have rituals linked to cleansing. For example, Christian baptism stands for the act of washing away sin.) Archaeologists have found figures of animals, such as bulls, that Indians still regard as holy. They also found clay figurines that may be goddesses or simply dolls. Harappan people used standard weights and measures. Across the region, they made similar bronze statues and clay toys. These artifacts show that the Harappans could afford to have more than just basic necessities. This was because they gained wealth from agriculture and trade. Archaeologists have found seals from the Indus Valley as far away as Mesopotamia. Indians traded timber, ivory, and beads. Mesopotamians sold the Indians silver, tin, and woolen cloth. Mohenjo-Daro - The ruins of the ancient city show how carefully planned it was. The streets were at right angles, and the walls were well built. The smaller photograph is the Great Bath, which was probably a public bathhouse. Pot - This pot was found in the cemetery in the city of Harappa. Around 2000 to 1500 B.C., earthquakes shook the region. These quakes probably caused the Saraswati River to dry up. The same natural disaster may have caused the Indus River to flood. The problems forced people to leave their cities. Harappan civilization went into decline. Another group of people soon took the place of Harappan civilization. 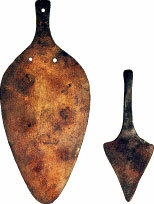 Copper Tools - Farmers used these tools for tasks such as weeding and leveling soil. • The rivers of India and the seasonal monsoons helped make agriculture possible. • Agricultural wealth led to the rise of a complex civilization in the Indus Valley. • The prosperous Harappan culture lasted for about 800 years. Why It Matters Now . . . Ancient Indians developed products that are still important today. They were the first people to domesticate chickens and the first Asians to produce cotton cloth.